May 16, 2018: Members of the Bronxville High School Model United Nations Club assumed the roles of U.N. ambassadors to debate a variety of current issues at the Heschel Model United Nations Conference, which was held in New York City on May 6. Student-delegates researched and prepared position papers for their assigned countries prior to attending the event. During the conference, they discussed the compelling issues in their committee and through the lens of their country and they listened and collaborated successfully with other countries to develop a mutual understanding and strategies to bridge differences to resolve complex problems. Over the course of the conference, the students were able to develop acceptable resolutions in their committees while maintaining a spirit of collaboration, diplomacy, and open-mindedness. Kevin Leka, a junior, won best delegate for representing France in the Social, Humanitarian and Cultural Committee on the topic of Honor Killings in the Middle East and South Asia. James Ferguson, a sophomore, won best delegate for representing Indonesia in the Special Political and Decolonization Committee on the topic of the Status of A, B & C in the West Bank. Patrick Mooney, a junior, won best delegate for representing France in the Disarmament and International Security Committee on the topic of the Iran-Saudi Arabia conflict. Nate Revadigar, a junior, won honorable mention for representing India in the Disarmament and International Security Committee on the topic of the Iran-Saudi Arabia conflict. Catherine Burnell, a junior, won honorable mention for representing France in the Security Council specialized agency on the topic of the Syrian Refugee Crisis. Allison Barker, a senior, won honorable mention for representing China in the Security Council specialized agency on the topic of Commission on the Status of Women: Female Genital Mutilation. 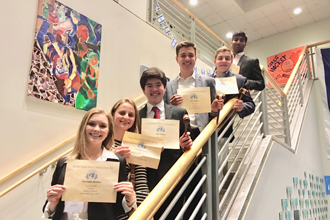 In addition to the Heschel Model United Nations Conference, members of the club also attended the Johns Hopkins University Model United Nations Conference and Model United Nations Conference at Princeton University. Pictured here (L to R): Bronxville High School students Catherine Burnell, Allison Barker, James Ferguson, Kevin Leka, Patrick Mooney, and Nate Revadigar.